Boost Your Buzz $1,000 Summer Giveaway is Coming Soon! 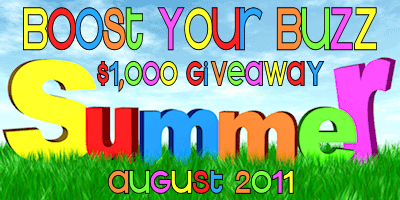 Boost Your Buzz $1,000 Summer Giveaway is almost here! At 12:00 am EST on August 1, 2011 you will be able to start entering the giveaway on Survey Junkie, Simply Stacie and Little Yaya’s so be sure to mark your calendars. We have an amazing group of participants that you can follow on Twitter, Facebook, Networked Blogs, Email, RSS, You Tube, Etsy, Blog Frog and more..
For more information you can check out my original Boost Your Buzz $1,000 Summer Giveaway Post. If your participating in the Boost Your Buzz $1,000 Summer Giveaway be sure to save Stacy’s email- pr(at)sjunkie.com so that you receive her reminder/BYB info. email about a week before the giveaway. Follow us on Twitter and Facebook to be notified when the next sign up opens along with other BYB info.